This fruity and filling blueberry spinach smoothie is a power packed breakfast. There’s no better way to start your day than with a delicious superfood smoothie and this one is no exception! It’s full of antioxidants from the berries and spinach and loaded with vitamins and minerals thanks to one of the most nutritious greens on the planet – chard. This smoothie follows the Fresh 5 template – a simple outline for truly healthy plant-based smoothies. These smoothies will help you lose weight, boost energy and vitality, and keep your skin youthful and glowing! For more Fresh 5 smoothies check out this apple spinach detox smoothie or this anti-inflammatory turmeric smoothie! This smoothie is full of rockstar ingredients! On top of the spinach and blueberries there’s chard, oats, and strawberries. Chard is a leafy green that’s even more nutrient dense than spinach or kale! Oats are an excellent source of fiber and protein. Strawberries are low in calories, fat-free, and very high in vitamin C.
But the antioxidative properties of blueberries and spinach are the real stars of this show. This spinach and blueberry smoothie may have a delectable blueberry muffin flavor, but don’t underestimate it! It packs some serious health benefits thanks to its powerhouse ingredients. When people think of healthy veggies, spinach is one of the first that comes to mind. This smoothie won’t give you superhuman strength like our favorite spinach eating cartoon Popeye might suggest, but spinach really is super. Spinach is a great source of vitamins and minerals and is rich in fiber, but spinach is also packed with antioxidants. Fresh Tip: Spinach has a subtle flavor that is easily overpowered by fruit. You can hide spinach in almost any smoothie, making it the perfect leafy green to boost your kid’s smoothies with! Blueberries are also renowned for their antioxidants with one the highest antioxidant contents among commonly consumed foods. Luckily, blueberries are healthy and delicious. I also use them as part of the base in this antioxidant rich acai smoothie bowl. Smoothies can be incredibly healthy, but the reason they’re my favorite is because they’re sooo easy. If you have a high powered blender it’s as easy as washing the fresh produce, tossing everything in the blender, and pressing a button! If you don’t have a high powered blender, try blending just the leafy greens and liquid first. This will help to liquefy your greens to the best of your blender’s capabilities! Fresh Tip: If you want to upgrade your blender, look into getting a refurbished model. Both Vitamix and Blendtec offer refurbished blenders at a huge discount. I saved $170 on my Vitamix by buying it refurbished. Seriously, their refurbished models can be considered as good as new. Want to take this smoothie to the next level? Try adding some superfood boosts. They’re optional in all my smoothie recipes, but I absolutely love their added health benefits! You can even tailor the boosts to your specific health needs like turmeric for autoimmune disease and inflammation, or matcha for weight loss and energy! For more info, check out this guide on using superfoods in smoothies. It covers the health benefits of each ‘superfood’ and the flavors they blend well with. For this smoothie I used acai powder and raw cacao powder which add a delicious chocolate berry flavor. Acai is a delicious berry with up to 10x the antioxidants of blueberries and cacao is one of the highest known food sources of antioxidants (up to 40x more than blueberries) among many other benefits! I find myself reaching for this smoothie as a filling breakfast on mornings that I’m in a rush. It’s just so nutritious and easy! It’s also great as a healthy dessert thanks to its sweet blueberry muffin flavor, especially if you add the cacao powder! I’m excited about this recipe and would love to hear some feedback. 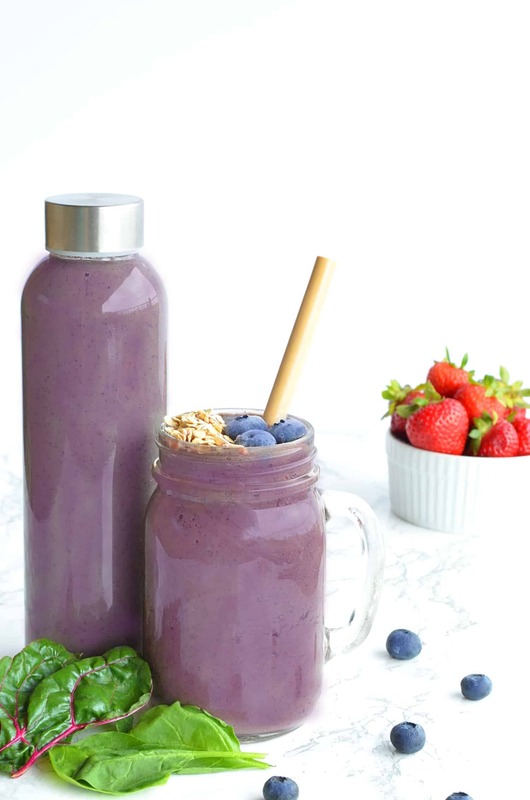 If you tried this blueberry spinach smoothie don’t forget to comment below! I love hearing from my readers. This smoothie was good I used kale instead of chard because its what I had on hand. Tastes like you said like a blueberry muffin. This smoothie was really good. I will be making it again! Hey, I love your article. I recently finished an article on preserving food. I like to make my own food for Fall!. I will be making a tasty dessert to go with it. The kids will be on holiday and I am sure they are going to love it. We love your site, it has engaging information, Thanks!